Al and Imogen like good design and good people. It's as simple as that. The two made the move from Melbourne to Freshwater Creek on the Surf Coast in Victoria in September 2016 in search for a home with space to create. It's early days for the chippy and designer as they spend their days on the farm experimenting with recycled materials, turning old into new. Al and Imo are open to new projects and love nothing more than delivering a custom piece of furniture to its forever home. We love nothing more that working with clients to create their forever furniture. The "Bookshelf Drawer Bed" combines two of our most popular designs. For ultimate storage and functionality, the base features drawers while the bookshelf bed head eliminates the need for bedside tables. 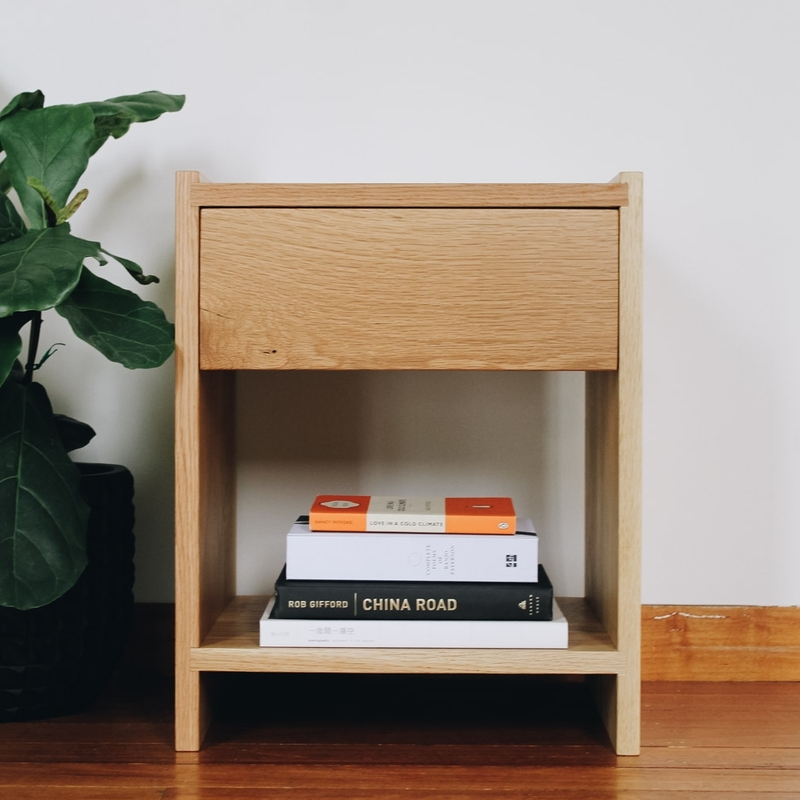 handmade from locally sourced recycled Australian hardwood. Limited print run of Al + Imo custom logo t-shirts. Black As Colour staple t-shirt with small logo on the front and large logo on the back. The "Platform drawer bed" is handmade from locally sourced recycled messmate timber. Featuring four drawers with dovetail joins around the platform base and a high headboard. A simple union of form and function. The "Low Bed" is the perfect foundation for contemporary aesthetics. This clean- lined design features thick rounded edge beams and no head board. The handmade low bed, a simple design with the modern minimalist in mind. The "Ledge Bed" is made from locally sourced recycled hardwood, sits low to the ground and features a large thick ledge with built-in bedside tables. This platform bed is a timeless design built for simple living. The "Platform bed with bookshelf bed head" is a hybrid of our bookshelf bed and platform bed. Featuring the popular bookshelves but elevated on top of a platform. Handmade from locally sourced, recycled hardwood timbers. A handmade tallboy to match our "Platform Drawer Bed". Made from locally sourced recycled messmate timber, featuring 6 drawers with dovetail joins. The "Bookshelf bed" is made up of four bookshelves which create a large platform for the mattress to sink into, eliminating the need for side tables. The bed frame is made up of a mixture of locally sourced recycled timber meaning each design is unique. The "Mod Bed" is Mid Century inspired and is handmade from locally sourced American Oak. The frame sits upon angled legs, making the bed appear to float. A simple and elegant design for the modern minimalist. Inspired to compliment our "Mod Bed" these elegant side tables, handmade from American Oak feature a single dovetailed drawer and low shelf. The lip on the top of the table, designed to keep your coffee mugs in place. The "Mod Bed" is Mid Century inspired and is handmade from locally sourced recycled messmate. The frame sits upon angled legs, making the bed appear to float. A simple and elegant design for the modern minimalist. The "Feature Headboard Square bed" is a standout bed frame that highlights the natural feature and grain in the timber. Warm tones in the locally sourced recycled messmate make this handcrafted bed a beautiful addition to any bedroom. Introducing the Square Shelf bed”. Lovingly handmade by Al on our farm using locally sourced Aussie hardwood. The new bed frame features an extended headboard with small shelf - just enough space for a bloody good book. The "Square bed" is handmade from locally sourced hardwood. The minimalist timber bed frame features finger join detail and gap gaps in the headboard. This is a simple and modest design that highlights the natural beauty of the the timber. The "Scandi bed" is handmade from locally sourced American oak. The timber bed frame features tapered legs and a headboard crafted with a gap detail. Danish inspired, this minimalist bed is a timeless design. Designed to compliment our Scandi Beds, These minimalist side tables feature the same square join and tapered leg. Handmade from American Oak, a classic - non- fuss style. Simple side table handmade from locally sourced recycled hardwood. Featuring a single drawer and square legs. These can be custom made to suit specific measurement. The "Tall Scandi Bed" is handmade from American Oak. The timber bed frame features tapered legs, a high headboard and foot end with gap detail. Danish inspired, this minimalist bed is a timeless design highlighting the natural beauty of the timber.